The netfilter framework, of which iptables is a part of, allows the system administrator to define rules for how to deal with network packets. Rules are grouped into chains—each chain is an ordered list of rules. Chains are grouped into tables—each table is associated with a different kind of packet processing. Each rule contains a specification of which packets match it and a target that specifies what to do with the packet if it is matched by that rule. Every network packet arriving at or leaving from the computer traverses at least one chain, and each rule on that chain attempts to match the packet. If the rule matches the packet, the traversal stops, and the rule's target dictates what to do with the packet. If a packet reaches the end of a predefined chain without being matched by any rule on the chain, the chain's policy target dictates what to do with the packet. If a packet reaches the end of a user-defined chain without being matched by any rule on the chain or the user-defined chain is empty, traversal continues on the calling chain (implicit target RETURN). Only predefined chains have policies. Rules in iptables are grouped into chains. A chain is a set of rules for IP packets, determining what to do with them. Each rule can possibly dump the packet out of the chain (short-circuit), and further chains are not considered. A chain may contain a link to another chain - if either the packet passes through that entire chain or matches a RETURN target rule it will continue in the first chain. There is no limit to how many nested chains there can be. There are three basic chains (INPUT, OUTPUT, and FORWARD), and the user can create as many as desired. A rule can merely be a pointer to a chain. There are three built-in tables, each of which contains some predefined chains. It is possible for extension modules to create new tables. The administrator can create and delete user-defined chains within any table. Initially, all chains are empty and have a policy target that allows all packets to pass without being blocked or altered in any fashion. FORWARD chain — All packets merely passing through the system (being routed) go through this chain. PREROUTING chain — Incoming packets pass through this chain before the local routing table is consulted, primarily for DNAT (destination-NAT). POSTROUTING chain — Outgoing packets pass through this chain after the routing decision has been made, primarily for SNAT (source-NAT). PREROUTING chain — All packets entering the system in any way, before routing decides whether the packet is to be forwarded (FORWARD chain) or is destined locally (INPUT chain). FORWARD chain — All packets merely passing through the system go through this chain. POSTROUTING chain — All packets leaving the system go through this chain. In addition to the built-in chains, the user can create any number of user-defined chains within each table, which allows them to group rules logically. Each chain contains a list of rules. When a packet is sent to a chain, it is compared against each rule in the chain in order. The rule specifies what properties the packet must have for the rule to match, such as the port number or IP address. If the rule does not match then processing continues with the next rule. If, however, the rule does match the packet, then the rule's target instructions are followed (and further processing of the chain is usually aborted). Some packet properties can only be examined in certain chains (for example, the outgoing network interface is not valid in the INPUT chain). Some targets can only be used in certain chains, and/or certain tables (for example, the SNAT target can only be used in the POSTROUTING chain of the nat table). The target of a rule can be the name of a user-defined chain or one of the built-in targets ACCEPT, DROP, QUEUE, or RETURN. When a target is the name of a user-defined chain, the packet is diverted to that chain for processing (much like a subroutine call in a programming language). If the packet makes it through the user-defined chain without being acted upon by one of the rules in that chain, processing of the packet resumes where it left off in the current chain. These inter-chain calls can be nested to an arbitrary depth. This target causes netfilter to accept the packet. What this means depends on which chain is doing the accepting. For instance, a packet that is accepted on the INPUT chain is allowed to be received by the host, a packet that is accepted on the OUTPUT chain is allowed to leave the host, and a packet that is accepted on the FORWARD chain is allowed to be routed through the host. This target causes netfilter to drop the packet without any further processing. The packet simply disappears without any indication of the fact that it was dropped being given to the sending host or application. This frequently appears to the sender as a communication timeout, which can cause confusion (though dropping undesirable inbound packets is often considered a good security policy, because it gives no indication to a potential attacker that your host even exists). This target causes the packet to be sent to a queue in user space. An application can use the libipq library, which also is part of the netfilter/iptables project, to alter the packet. If there is no application that reads the queue, this target is equal to DROP. According to the official netfilter documentation, this target has the same effect of falling off the end of a chain: for a rule in a built-in chain, the policy of the chain is executed. For a rule in a user-defined chain, the traversal continues at the previous chain, just after the rule which jumped to this chain. This target has the same effect as 'DROP' except that it sends an error packet back to the original sender. It is mainly used in the INPUT or FORWARD chains of the filter table. The type of packet can be controlled thorough the '--reject-with' parameter. A rejection packet can explicitly state that the connection has been filtered (an ICMP connection-administratively-filtered packet), though most users prefer that the packet will simply state that the computer does not accept that type of connection (such packet will be a tcp-reset packet for denied TCP connections, an icmp-port-unreachable for denied udp sessions or an icmp-protocol-unreachable for non-tcp non-udp packets). If the '--reject-with' parameter hasn't been specified, the default rejection packet is always icmp-port-unreachable. This target logs the packet. This can be used in any chain in any table, and is often used for debugging (such as to see which packets are being dropped). This target causes the packet's destination address (and optionally port) to be rewritten for network address translation. The '--to-destination' flag must be supplied to indicate the destination to use. This is only valid in the OUTPUT and PREROUTING chains within the nat table. This decision is remembered for all future packets which belong to the same connection, and replies will have their source address and port changed back to the original (ie. the reverse of this packet). This target causes the packet's source address (and optionally port) to be rewritten for network address translation. The '--to-source' flag must be supplied to indicate the source to use. This is only valid in the POSTROUTING chain within the nat table, and like DNAT, is remembered for all other packets belonging to the same connection. This is a special, restricted form of SNAT for dynamic IP addresses, such as most Internet service providers provide for modems or DSL. Rather than change the SNAT rule every time the IP address changes, this calculates the source IP address to use by looking at the IP address of the outgoing interface when a packet matches this rule. In addition, it remembers which connections used MASQUERADE, and if the interface address changes (such as reconnecting to the ISP), all connections NATted to the old address are forgotten. One of the important features built on top of the netfilter framework is connection tracking. Connection tracking allows the kernel to keep track of all logical network connections or sessions, and thereby relate all of the packets which may make up that connection. NAT relies on this information to translate all related packets in the same way, and iptables can use this information to act as a stateful firewall. Connection tracking classifies each packet as being in one of four states: NEW (trying to create a new connection), ESTABLISHED (part of an already-existing connection), RELATED (related to, but not actually part of an existing connection) or INVALID (not part of an existing connection, and unable to create a new connection). A normal example would be that the first packet the firewall sees will be classified NEW, the reply would be classified ESTABLISHED and an ICMP error would be RELATED. An ICMP error packet which did not match any known connection would be INVALID. The connection state is completely independent of any TCP state. If the host answers with a SYN ACK packet to acknowledge a new incoming TCP connection, the TCP connection itself is not yet established but the tracked connection is - this packet will match the state ESTABLISHED. A tracked connection of a stateless protocol like UDP nevertheless has a connection state. Furthermore, through the use of plugin modules, connection tracking can be given knowledge of application layer protocols and thus understand that two or more distinct connections are "related". For example, consider the FTP protocol. A control connection is established, but whenever data is transferred, a separate connection is established to transfer it. When the ip_conntrack_ftp module is loaded, the first packet of an FTP data connection will be classified RELATED instead of NEW, as it is logically part of an existing connection. iptables can use the connection tracking information to make packet filtering rules more powerful and easier to manage. The "conntrack" match extension allows iptables rules to examine the connection tracking classification for a packet. For example, one rule might allow NEW packets only from inside the firewall to outside, but allow RELATED and ESTABLISHED in either direction. This allows normal reply packets from the outside (ESTABLISHED), but does not allow new connections to come from the outside to the inside. However, if an FTP data connection needs to come from outside the firewall to the inside, it will be allowed, because the packet will be correctly classified as RELATED to the FTP control connection, rather than a NEW connection. 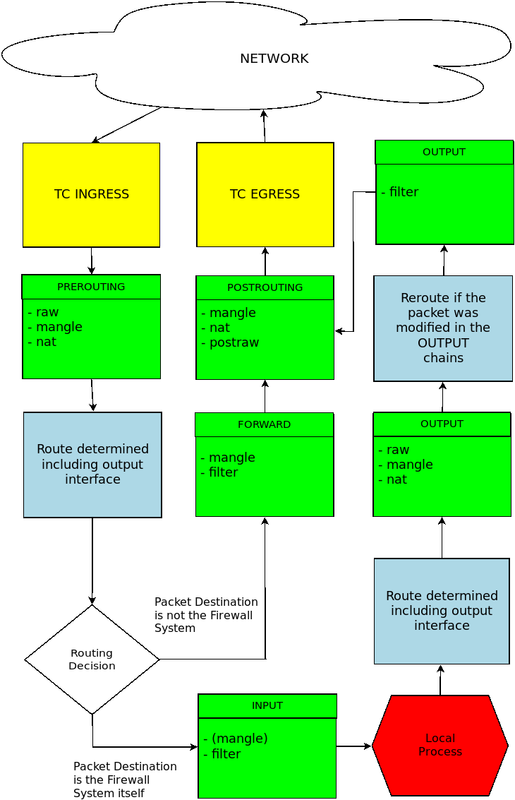 iptables is a user space application program that allows a system administrator to configure the netfilter tables, chains, and rules (described above). Because iptables requires elevated privileges to operate, it must be executed by user root, otherwise it fails to function. On most Linux systems, iptables is installed as /sbin/iptables. The detailed syntax of the iptables command is documented in its man page, which can be displayed by typing the command "man iptables". Makes the command apply to the specified table. When this option is omitted, the command applies to the filter table by default. Produces numeric output (i.e., port numbers instead of service names, and IP addresses instead of domain names). When listing rules, add line numbers to the beginning of each rule, corresponding to that rule's position in its chain. Most iptables command forms require you to provide a rule-specification, which is used to match a particular subset of the network packet traffic being processed by a chain. The rule-specification also includes a target that specifies what to do with packets that are matched by the rule. The following options are used (frequently in combination with each other) to create a rule-specification. Specifies the target of a rule. The target is either the name of a user-defined chain (created using the -N option), one of the built-in targets, ACCEPT, DROP, QUEUE, or RETURN, or an extension target, such as REJECT, LOG, DNAT, or SNAT. If this option is omitted in a rule, then matching the rule will have no effect on a packet's fate, but the counters on the rule will be incremented. Name of an interface via which a packet is going to be received (only for packets entering the INPUT, FORWARD and PREROUTING chains). When the '!' argument is used before the interface name, the sense is inverted. If the interface name ends in a '+', then any interface which begins with this name will match. If this option is omitted, any interface name will match. Name of an interface via which a packet is going to be sent (for packets entering the FORWARD, OUTPUT and POSTROUTING chains). When the '!' argument is used before the interface name, the sense is inverted. If the interface name ends in a '+', then any interface which begins with this name will match. If this option is omitted, any interface name will match. Matches packets of the specified protocol name. If '!' precedes the protocol name, this matches all packets that are not of the specified protocol. Valid protocol names are icmp, udp, tcp... A list of all the valid protocols could be found in the file /etc/protocols. Matches IP packets coming from the specified source address. The source address can be an IP address, an IP address with associated w:network prefix, or a hostname. If '!' precedes the source, this matches all packets that are not coming from the specified source. Matches IP packets going to the specified destination address. The destination address can be an IP address, an IP address with associated w:network prefix, or a hostname. If '!' precedes the destination, this matches all packets that are not going to the specified destination. Matches TCP or UDP packets (depending on the argument to the -p option) destined for the specified port or the range of ports (when the port:port form is used). If '!' precedes the port specification, this matches all TCP or UDP packets not destined for the specified port or port range. Matches TCP or UDP packets (depending on the argument to the -p option) coming from the specified port or the range of ports (when the port:port form is used). If '!' precedes the port specification, this matches all TCP or UDP packets not coming from the specified port or port range. Matches TCP packets having certain TCP protocol flags set or unset. The first argument specified the flags to be examined in each TCP packet, written as a comma-separated list (no spaces allowed). The second argument is a comma-separated list of flags which must be set within those that are examined. The flags are: SYN, ACK, FIN, RST, URG, PSH, ALL, and NONE. Hence, the option "--tcp-flags SYN,ACK,FIN,RST SYN" will only match packets with the SYN flag set and the ACK, FIN and RST flags unset. Matches TCP packets having the SYN flag set and the ACK,RST and FIN flags unset. Such packets are used to initiate TCP connections. Blocking such packets on the INPUT chain will prevent incoming TCP connections, but outgoing TCP connections will be unaffected. This option can be combined with others, such as --source to block or allow inbound TCP connections only from certain hosts or networks. This option is equivalent to "--tcp-flags SYN,RST,ACK SYN". If the '!' flag precedes the --syn, the sense of the option is inverted. The above command actually deletes the first rule on the INPUT chain that matches the rule-specification "-p udp -j DROP". If there are multiple identical rules on the chain, only the first matching rule is deleted. This form of the command is used to create (-N or --new-chain) a new user-defined chain or to delete (-X or --delete-chain) an existing user-defined chain. If no chain is specified with the -X or --delete-chain options, all user-defined chains are deleted. It is not possible to delete built-in chains, such as the INPUT or OUTPUT chains in the filter table. This form of the command is used to rename a user-defined chain. 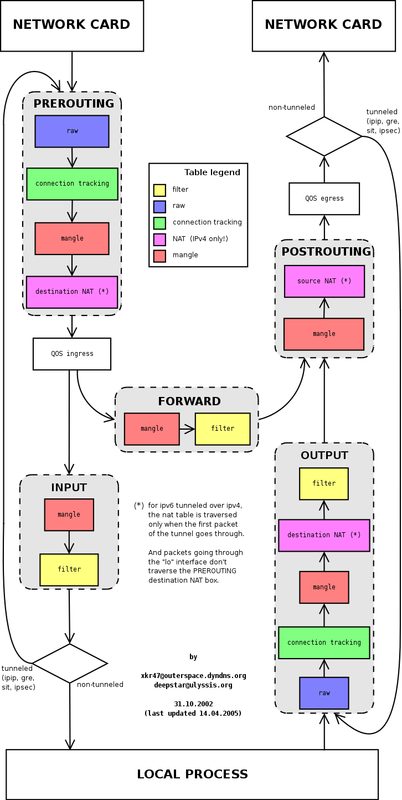 ipset is used to set up, maintain and inspect so called "IP sets" in the Linux kernel. In IP set usually contains a set of IP addresses, but can also contain sets of other network numbers, depending on its "type". Any entry in one set can be bound to another set, allowing for sophisticated matching operations. A set can only be removed (destroyed) if there are no iptables rules or other sets referring to it. These options specify the specific action to perform. Only one of them can be specified on the command line unless otherwise specified below. For all the long versions of the command and option names, you need to use only enough letters to ensure that ipset can differentiate it from all other options. Create a set identified with setname and specified type. Type-specific options must be supplied. Destroy the specified set, or all sets if none or the keyword ":all:" is specified. Before destroying the set, all bindings belonging to the set elements and the default binding of the set are removed. If the set is still referenced, nothing is done. Delete all entries from the specified set, or flush all sets if none or the keyword ":all:" is given. Bindings are not affected by the flush operation. Rename a set. Set identified by to-setname must not exist. Swap two sets as they referenced in the Linux kernel. iptables rules or ipset bindings pointing to the content of from-setname will point to the content of to-setname and vice versa. Both sets must exist. List the entries and bindings for the specified set, or for all sets if none or the keyword ":all:" is given. The -n, --numeric option can be used to suppress name lookups and generate numeric output. When the -s, --sorted option is given, the entries are listed sorted (if the given set type supports the operation). Save the given set, or all sets if none or the keyword :all: is specified to stdout in a format that—restore can read. Restore a saved session generated by—save. The saved session can be fed from stdin. When generating a session file please note that the supported commands (create set, add element, bind) must appear in a strict order: first create the set, then add all elements. Then create the next set, add all its elements and so on. Finally you can list all binding commands. Also, it is a restore operation, so the sets being restored must not exist. -A, --add setname IP Add an IP to a set. -D, --del setname IP Delete an IP from a set. -T, --test setname IP Test whether an IP is in a set or not. Exit status number is zero if the tested IP is in the set and nonzero if it is missing from the set. -T, --test setname IP—binding to-setname Test whether the IP belonging to the set points to the specified binding. Exit status number is zero if the binding points to the specified set, otherwise it is nonzero. The keyword :default: can be used to test the default binding of the set. -B, --bind setname IP—binding to-setname Bind the IP in setname to-setname. -U, --unbind setname IP Delete the binding belonging to IP in set setname. -H, --help [settype] Print help and settype specific help if settype specified. At the -B, -U and -T commands you can use the token :default: to bind, unbind or test the default binding of a set instead of an IP. At the -U command you can use the token :all: to destroy the bindings of all elements of a set. -b, --binding setname The option specifies the value of the binding for the -B binding command, for which it is a mandatory option. You can use it in the -T test command as well to test bindings. -s, --sorted Sorted output. When listing sets, entries are listed sorted. -n, --numeric Numeric output. When listing sets, bindings, IP addresses and port numbers will be printed in numeric format. By default the program will try to display them as host names, network names or services (whenever applicable), which can trigger slow DNS lookups. -q, --quiet Suppress any output to stdout and stderr. ipset will still return possible errors. The ipmap set type uses a memory range, where each bit represents one IP address. An ipmap set can store up to 65536 (B-class network) IP addresses. The ipmap set type is very fast and memory cheap, great for use when one want to match certain IPs in a range. Using the—netmask option with a CIDR netmask value between 0-32 when creating an ipmap set, you will be able to store and match network addresses: i.e. an IP address will be in the set if the value resulted by masking the address with the specified netmask can be found in the set. --from from-IP—to-IP Create an ipmap set from the specified range. --network IP/mask Create an ipmap set from the specified network. --netmask CIDR-netmask When the optional—netmask parameter specified, network addresses will be stored in the set instead of IP addresses, and the from-IP parameter must be a network address. The macipmap set type uses a memory range, where each 8 bytes represents one IP and a MAC addresses. A macipmap set type can store up to 65536 (B-class network) IP addresses with MAC. When adding an entry to a macipmap set, you must specify the entry as IP%MAC. When deleting or testing macipmap entries, the %MAC part is not mandatory. --from from-IP—to-IP Create a macipmap set from the specified range. --network IP/mask Create a macipmap set from the specified network. --matchunset When the optional—matchunset parameter specified, IP addresses which could be stored in the set but not set yet, will always match. Please note, the set and SET netfilter kernel modules always use the source MAC address from the packet to match, add or delete entries from a macipmap type of set. The portmap set type uses a memory range, where each bit represents one port. A portmap set type can store up to 65536 ports. The portmap set type is very fast and memory cheap. --from from-port—to-port Create a portmap set from the specified range. The iphash set type uses a hash to store IP addresses. In order to avoid clashes in the hash double-hashing, and as a last resort, dynamic growing of the hash performed. The iphash set type is great to store random addresses. By supplyig the—netmask option with a CIDR netmask value between 0-32 at creating the set, you will be able to store and match network addresses instead: i.e. an IP address will be in the set if the value of the address masked with the specified netmask can be found in the set. --hashsize hashsize The initial hash size (default 1024) --probes probes How many times try to resolve clashing at adding an IP to the hash by double-hashing (default 8). --resize percent Increase the hash size by this many percent (default 50) when adding an IP to the hash could not be performed after probes number of double-hashing. --netmask CIDR-netmask When the optional—netmask parameter specified, network addresses will be stored in the set instead of IP addresses. Sets created by zero valued resize parameter won't be resized at all. The lookup time in an iphash type of set approximately linearly grows with the value of the probes parameter. At the same time higher probes values result a better utilized hash while smaller values produce a larger, sparse hash. The nethash set type uses a hash to store different size of network addresses. The IP "address" used in the ipset commands must be in the form IP-address/cidr-size where the CIDR block size must be in the inclusive range of 1-31. In order to avoid clashes in the hash double-hashing, and as a last resort, dynamic growing of the hash performed. --hashsize hashsize The initial hash size (default 1024) --probes probes How many times try to resolve clashing at adding an IP to the hash by double-hashing (default 4). --resize percent Increase the hash size by this many percent (default 50) when adding an IP to the hash could not be performed after An IP address will be in a nethash type of set if it is in any of the netblocks added to the set and the matching always start from the smallest size of netblock (most specific netmask) to the biggest ones (least specific netmasks). When adding/deleting IP addresses to a nethash set by the SET netfilter kernel module, it will be added/deleted by the smallest netblock size which can be found in the set. The lookup time in a nethash type of set is approximately linearly grows with the times of the probes parameter and the number of different mask parameters in the hash. Otherwise the same speed and memory efficiency comments applies here as at the iphash type. The ipporthash set type uses a hash to store IP address and port pairs. In order to avoid clashes in the hash double-hashing, and as a last resort, dynamic growing of the hash performed. An ipporthash set can store up to 65536 (B-class network) IP addresses with all possible port values. When adding, deleting and testing values in an ipporthash type of set, the entries must be specified as "IP%port". The ipporthash types of sets evaluates two src/dst parameters of the set match and SET target. --from from-IP—to-IP Create an ipporthash set from the specified range. --network IP/mask Create an ipporthash set from the specified network. --hashsize hashsize The initial hash size (default 1024) --probes probes How many times try to resolve clashing at adding an IP to the hash by double-hashing (default 8). --resize percent Increase the hash size by this many percent (default 50) when adding an IP to the hash could not be performed after probes number of double-hashing. The same resizing, speed and memory efficiency comments applies here as at the iphash type. The iptree set type uses a tree to store IP addresses, optionally with timeout values. Options to use when creating an iptree set: --timeout value The timeout value for the entries in seconds (default 0) When adding an IP address to a set, one may add it with a specific timeout value using the syntax IP%timeout-value.